For three years I have shared our adventure stories with the hopes that we might just inspire one of you to get active and fit with your dog. We aim to lead by example but I have also offered some tips to help get you started along the way. 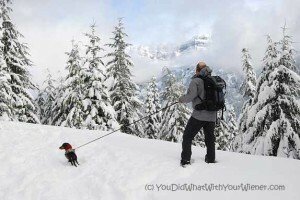 Today I want to share one of our favorite winter activities with you – snowshoeing with your dog. I am always a bit disappointed at first when snow falls in our mountains. My mind still clings to the summer ease of grabbing boots, snacks, some water, and heading out to hike one of the hundreds of trails within a couple of hours of where we live. In order to stay active, and in hiking shape, I have to embrace the cold, the snow and the idea that heading out in the woods now takes a little more planning and preparation. After a while, winter snowshoeing becomes as much of our routine as summer hiking (well, almost. We don’t get out quite as often). Snowshoeing with your dog brings a different kind of fun and challenge that you don’t get hiking dry trails in the sun. It most certainly brings an unmatched beauty that I often find more awe-inspiring than summer views of the same peaks. Looks fun! Wish we got enough snow to do that. Our previous dog, a little JRT, was NOT a fan of snow….he would inevitably try to ride on the back of the snowshoes, which made progress a bit slow! Our current lab mixes are great snow lovers, and since we use a trekking/skijoring lead when we snowshoe, they actually help pull us up the steeps! How incredibly fun!! As a S. Florida pack we never see this! Our closest is running on the beach, where you sink to the sand. Chester and Gretel look like they are having a blast! Such a cool activity to do with your dogs. Slimdoggy Jack would need a set of snowshoes probably! Thanks for joining FitDog Friday and have a great holiday. That was awesome video! I absolutely love the look of that trail – very serene and peaceful. I also love that you shared a video – heavy breathing and all! I often take video of me and Charlie hiking and then decide not to use it because I’m breathing too heavy or had to stop and blow my nose… like heavy breathing isn’t allowed on hikes – duh, you’re SUPPOSED to breathe heavy when exercising! I appreciate that you let us see the “real” you. I can’t wait to try snowshoeing with Charlie this winter. Hopefully it’ll help us get out more often during the winter when the snow is too deep for hiking. Also, my mom (with her overweight Chihuahua) saw the video and was impressed to see small dogs with short legs hiking in the snow… you’re doing great work by showing people that ANY dog is capable of exercising. Well, it’s less “letting you see the real me” and more “I don’t have a clue how to edit video”. Ha, ha. Yes, I don’t mind though because it does show that I am getting a good workout. This is one to be bookmarked for the future. Thank you, Jessica. I finally got around to buying my hiking book. Love your new profile picture. Thanks for stopping by. I still haven’t forgotten about us going hiking sometime. I am sure you will have your hands full for a while with two new pups. I had some more thoughts about that pet conference idea you mentioned earlier too. Let me know if you want to chat about it sometime. They are so cute. Bring on the Iditarod!! Snow shoeing is hard. Great exercise. Thanks for sharing! Man those trails are pretty packed down! Another advantage to snowshoeing – low impact on the environment! With that snow covering everything, its hard to damage anything! And don’t worry, I huff and puff ALOT lounder haha! Most of the trails where we are, are plowed or groomed, so Mom doesn’t need snowshoes, but if we go where she needs snowshoes then it is too much snow for us to get through for more than about ten minutes. They have such cool snowshoes now, Mom would love to try them out but we just don’t know how we would get through all that snow. It does look fun – look at how happy those dogs are! But my calves are aching just thinking about snow shoes. Part of me would love to do it, especially to see the beauty of the snow and experience the peace of the trails etc, but my dogs would probably leave home. Greyhounds are not well adapted for snowy hikes, especially as seniors and one with three legs! Perhaps it’s a good thing we simply don’t get that much snow here.